Indulge your skin and your senses with this gentle, hydrating cream wash lightly fragranced with Tropical Pineapple and White Peach. Enriched with Macadamia and Sunflower oils to provide long-lasting moisture along with AHAVA’s propriety Osmoter – a balanced concentrate of Dead Sea Minerals. This wash matches perfectly with and enhances the fragrance and effects of AHAVA Mineral Botanic Body Lotion Tropical Pineapple and White Peach. Your skin is for life - protect it well. 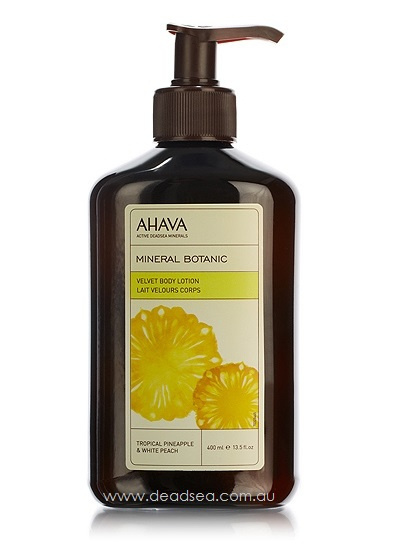 AHAVA Mineral Botanic is a body wash free of SLS (harsh detergents). This is why its foam is different and more velvety than regular soaps. Formulated to moisturise, smooth and refine the skin's texture, leaving it clean and nurtured. Directions: Apply to clean, dry skin after using Mineral Botanic Cream Wash in Pineapple & Peach. Usage: approximately 1 pump for arms, 1 pump for each leg, and 1-2 pumps for the rest of the body. Ingredients: Aqua (Mineral Spring Water), Aloe Barbadensis Leaf Juice, Glycerin, Ceteareth-30, Cetearyl Alcohol, Isohexadecane, Cyclomethicone, Cetyl Alcohol, Ethylhexyl Palmitate, Butyrospermum Parkii (Shea) Butter, Parfum (Fragrance), Phenoxyethanol, Maris Aqua (Dead Sea Water), Sodium Cetearyl Sulfate, Caprylyl Glycol, Chlorphenesin, Ananas Sativus (Pineapple) Fruit Extract, Propylene Glycol, Prunus Persica (Peach) Fruit Extract, Xanthan Gum, Sodium Citrate, Citric Acid, Hexyl Cinnamal, Butylphenyl Methylpropional, Hydroxyisohexyl 3-Cyclohexene Carboxaldehyde, Alpha Isomethyl Ionone, Citronellol. Directions: Apply to clean, dry skin after using Mineral Botanic Cream Wash in Hibiscus & Fig. Usage: approximately 1 pump for arms, 1 pump for each leg, and 1-2 pumps for the rest of the body. Ingredients: Aqua (Mineral Spring Water), Glycerin, Ceteareth-30 & Cetearyl Alcohol, Isohexadecane, Cyclomethicone, Cetyl Alcohol, Sodium Cetearyl Sulfate, Ethylhexyl Palmitate, Caprylyl Glycol & Chlorphenesin & Phenoxyethanol, Butyrospermum Parkii (Shea Butter), Maris Aqua (Dead Sea Water), Parfum (Fragrance), Aloe Barbadensis Leaf Juice, Xanthan Gum, Hibiscus Sabdariffa Flower Extract & Propylene Glycol Dicaprylate\Dicaprate &Aqua (Water), Ficus Carica (Fig) Fruit Extract, Lactic Acid, Benzyl Cinnamate, Benzyl Salicylate, Butylphenyl Methylpropional, Citronellol, Hexyl Cinnamal, Limonene, Eugenol. Directions: Apply to clean, dry skin after using Mineral Botanic Cream Wash in Lotus & Chestnut. Usage: approximately 1 pump for arms, 1 pump for each leg, and 1-2 pumps for the rest of the body. Ingredients: Aqua (Mineral Spring Water), Glycerin, Ceteareth-30 &Cetearyl Alcohol, Isohexadecane, Cyclomethicone, Cetyl Alcohol, Sodium Cetearyl Sulfate, Ethylhexyl Palmitate, Caprylyl Glycol & Chlorphenesin & Phenoxyethanol, Butyrospermum Parkii (Shea Butter), Maris Aqua (Dead Sea Water), Parfum (Fragrance), Aloe Barbadensis Leaf Juice, Xanthan Gum, Nelumbo Nucifera (Lotus) Flower Extract &Propylene Glycol Dicaprylate\Dicaprate & Aqua (Water), Castanea Sativa (Chestnut) Seed Extract, Lactic Acid, Alpha Isomethyl Ionone, Butylphenyl Methylpropional, Citronellol, Hexyl Cinnamal, Limonene, Linalool. Directions: Apply to clean, dry skin after using Mineral Botanic Cream Wash in Lemon & Sage. Usage: approximately 1 pump for arms, 1 pump for each leg, and 1-2 pumps for the rest of the body. Ingredients: Aqua (Mineral Spring Water), Glycerin, Ceteareth-30, Cetearyl Alcohol, Isohexadecane, Cyclomethicone, Cetyl Alcohol, Ethylhexyl Palmitate, Butyrospermum Parkii (Shea) Butter, Phenoxyethanol, Cetearyl Alcohol, Sodium Cetearyl Sulfate, Maris Aqua (Dead Sea Water), Aloe Barbadensis Leaf Juice, Caprylyl Glycol, Xanthan Gum, Chlorphenesin, Salvia Officinalis (Sage) Leaf Water, Parfum (Fragrance), Citrus Medica Limonum (Lemon) Peel Extract, Sorbic Acid, Lactic Acid, Limonene, Citral, Linalool.